Summary: Beautiful warm day today but rain and thunderstorms return tonight. Friday will be slightly cooler but dry. Saturday/Sunday will be cooler with snow possibilities. Next week will be cooler than we are used to. Note: I decided to hold off on yesterday’s site update to update you today and Saturday AM on the potential for snow Saturday PM. This way you get the most accurate info on Saturday instead of Friday. Another note: I am aware of the issue of these updates being sent twice to emails, acting as if you’ve double subscribed. It is a bug that I’m working on. I apologize for the double send. During the day today, expect a perfect day, with temps in the low 70’s under sunny skies. Winds will be out of the southwest at 10 mph. Tonight is when things change for us. 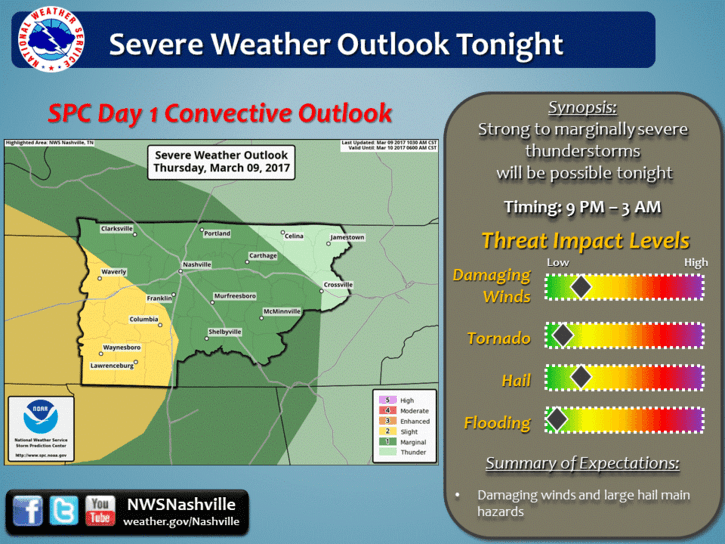 We are outlooked for a SLIGHT (yellow) risk of severe weather for tonight and through the overnight hours. This is a 2 on a scale of 0 to 5. This is due to a cold front moving in and bringing with it some rain and thunderstorms. We have a 60% chance of rain for tonight. 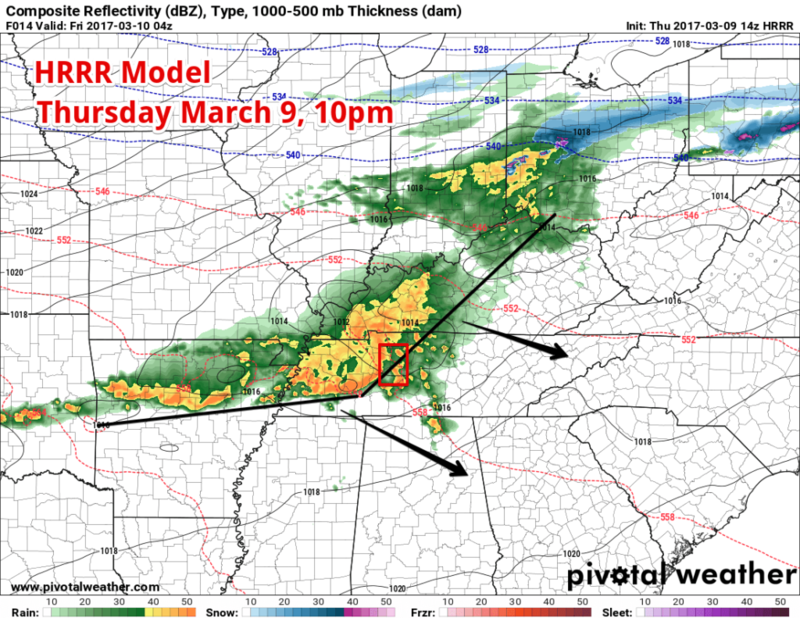 The HRRR model shows us what we can expect into the overnight hours. Rain will start to develop ahead of a cold front off to our west northwest, then expand as it moves toward us. The line of showers with a couple of embedded storms will arrive around 10pm, but some stray showers may develop ahead of that line, giving us a chance to see rain as early as 7pm to 8pm. The main threat with tonight’s storms will be large hail and localized damaging winds, but an isolated tornado cannot be ruled out. After the front moves through, our low temperature will drop to about 47 degrees. Winds will start out out of the south southwest at 10 to 15 mph, with gusts up to 20 mph, then change to come out of the north after midnight when the cold front comes through. Overnight rains move out and give us a sunny dry, but cooler Friday. The high will reach about 52 degrees with winds coming from the north (so it will feel cooler than 52 degrees) at 10 to 15mph, with gusts as high as 25 mph. Friday is a good day to go outside and protect any sensitive plants and vegetation, as this weekend and early part of the week will see winter make a return. Cover/bring in any plants that you can. Overnight, clouds start to move back in as our low temperature drops to below freezing to about 30. Winds will still be out of the north northeast at 5 to 10mph. Rain returns on Saturday after 12pm with a 70% chance of rain. Until then, ti will be mostly cloudy with a high temp of only 40 degrees. Winds will come out of the east northeast at 10mph. Saturday afternoon is when things start to get interesting. The models aren’t quite on the same page yet as far as timing, but we expect rain to start then change over to snow around dusk. Here’s the current GFS prediction of what type of precip we can expect. This isn’t a simulated radar, but simply snapshots of given precipitation at a certain time. Medium range models are *just* now starting to come in range for Saturday. Here’s the latest NAM4 simulated radar for as far out as it currently goes at the time of writing. 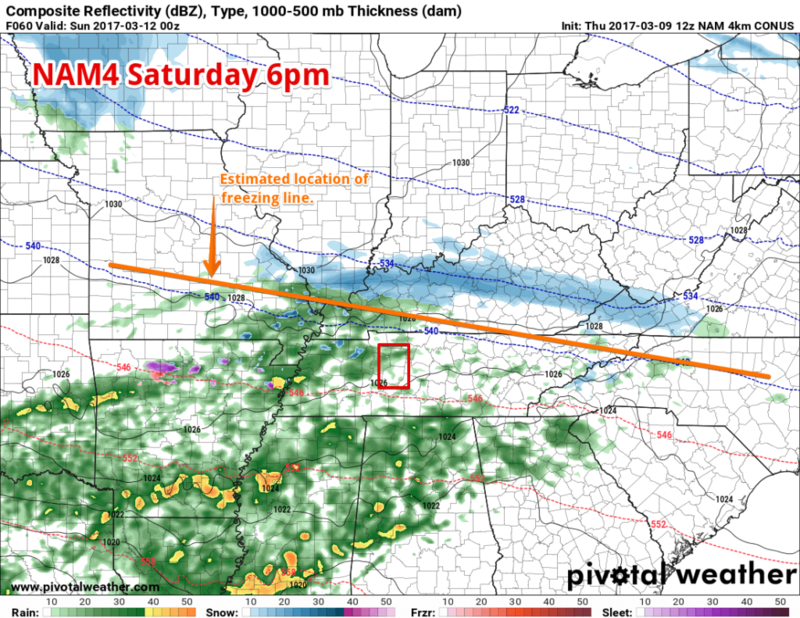 You can see it believes the rain/snow line will be in Kentucky at roughly 6pm. So how much snow and where will we see it? We should start the day on Saturday with freezing temperatures, mainly in the upper 20s to lower 30s. By late morning, as temperatures warm into the middle and upper 30s, precipitation will likely start to spread in from the west...falling as a rain and snow mix over the north and as all rain across the south. By late Saturday afternoon the precipitation over the northwest, around Clarksville, may change to all snow. 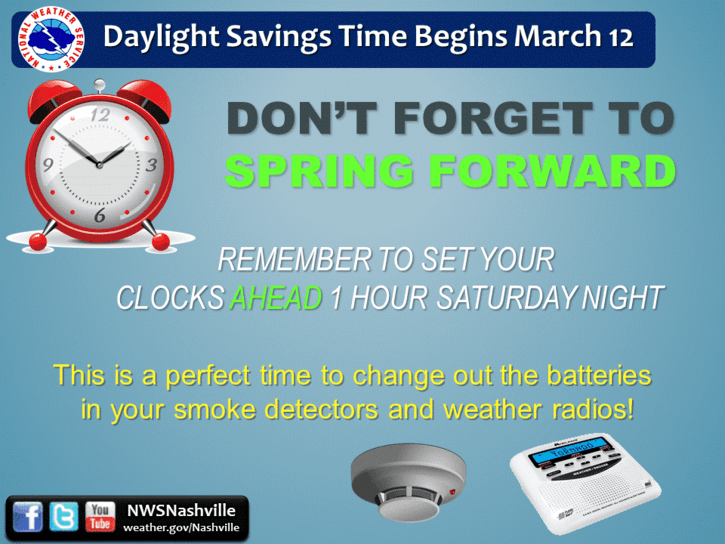 A change to all snow is expected in the Nashville area and along the Cumberland Plateau around sunset on Saturday, or shortly thereafter. As Saturday night wears on, temperatures will continue to fall, as light snow spreads across other parts of northern Middle Tennessee. A rain and snow mix over the south will probably only turn to snow briefly Saturday night, before tapering off to flurries. As a result, only a dusting of snow is expected over southern areas. Since this weather event is still a few days away, there is still a good deal of uncertainty as to how much snow accumulation will occur. However, right now, it looks like most areas along and north of Interstate 40 will stand a chance of getting up to an inch, with the Cumberland Plateau possibly picking up around two inches. Thanks to our recent warm weather, ground temperatures will be pretty warm this weekend. However, as temperatures drop into the middle and upper 20s Saturday night, some slick spots could develop on area roadways, especially over the north. You should stay informed of the weather forecast this weekend and be ready to adjust your travel plans as needed, especially for Saturday night. I’ll post more in the coming updates, and on Twitter. 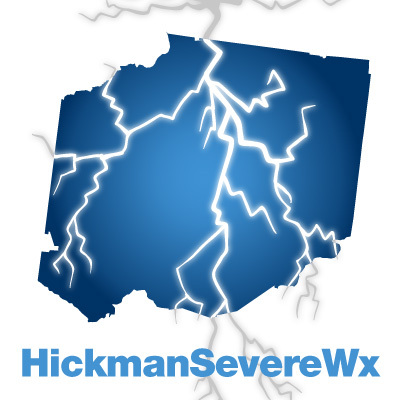 Next site update will likely be Saturday unless Friday brings considerable changes to the forecast. Overnight lows Saturday into Sunday will drop to below freezing at 26 degrees, so prep any sensitive outdoor plants or vegetation, and take care of outdoor animals. Snow looks to move out by Sunday, as our high temperature reaches around 43 degrees under mostly sunny skies. If any snow remains on the ground, the sun and temperature will quickly take care of it as we work through Sunday. Sunday night our low temperature will drop again below freezing to about 28 degrees. The beginning of our workweek sees rain return and even another shot of some snow on Monday night into Tuesday. Monday though is too far away to give any specific details on. Tuesday dries up but leaves us with mid 40’s for highs, carrying into Wednesday. With winter trying to make one final push to make us know we didn’t skip right over winter, and with people (myself included) anxious to get plants going outside, I thought I would share this glimpse into temperatures expected over the next 7 to 10 days. Each frame is a 3 hour jump, starting with today.